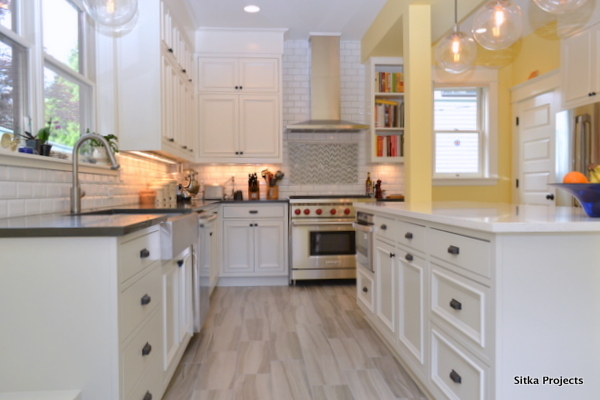 Sitka Projects constructed and installed the custom cabinetry for this stunning kitchen remodel. All cabinets are constructed using ¾” plywood with soft close, concealed, hinges and dovetailed drawers. Custom storage solutions include drawer organizers, a half moon pull out on the corner base cabinet, a pantry cabinet containing 3 pull out trays, and a double 35 quart trash pullout. and Custom Cabinetry vs. Modular Cabinetry. Newer Post Rosemont Summit – Upscale Kitchen, Fireplace, and Flooring Remodel	Older Post Sitka Projects – Recipient of two 2014 ORA Awards!